Rarely does the virus speak so formidably to the condition he is a product of. 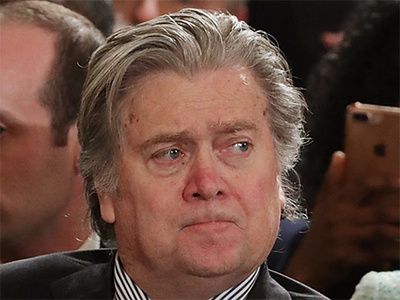 The soiling, devastating strategist Steve Bannon, despite exiting the Trump administration, remains within it (symbolically at least), moving about with effect and influence. But it is a legacy of mixed curses that bodes ill for the Republican Party. The one call he repeats with truncheon carrying persistence is one of division. This is not a man who believes, let alone tolerates, unified fronts. Disunity is his bread, butter and caviar. Where a front of consensus appears, his shock methods seek to disrupt it. And nothing, for Bannon, would be more reflective of failure than a united GOP, lips moving in synchronous agreement, all on that one vast page of political thought. Unless, of course, they agreed with him. His performance on the 60 Minutes show was nothing short than pure in its protest. In his discussion with Charlie Rose, the familiar terms were deployed with weaponized zeal. Targets were identified, elites excoriated. There were those troublesome individuals, the “swamp”, the establishment. All were given a generous verbal lashing. Everything else followed: the stuttering, the plodding, the meandering of the Republicans. “I think their choice,” he predicts of the GOP functionaries in response to such instruments as the Affordable Care Act, “is going to be you’re not going to be able to totally repeal it.” As, indeed, it is proving to be. Of course, nothing would be Bannon without the crystal ball, the gloomy prediction with its rich wafting of apocalypse. The GOP, he surmises, will duly be divided, and will suffer come the 2018 elections. He expressed particular worry about how the Republicans will fall on their sword regarding the matter of immigration and undocumented labour, the great poisoned chalice of US politics. The Deferred Action for Childhood Arrivals (DACA) program, introduced by President Barack Obama in 2012, is a point of considerable demurral. President Donald Trump promised on September 5 to repeal the measure, which allows applicants who arrived in the US before the age of 16, subject to various conditions (continuous residence, study, lack of a criminal record), the chance to receive work permits. There was one softening concession: a six month grace period before the program joints the ranks of history.